Happy Friday friends! Welcome to another wonderful party! We had a great turnout last week, and I sure hope you are bringing some more amazing recipes today. First off, let's take a look at this week's amazing giveaway for three lucky randomly selected links! 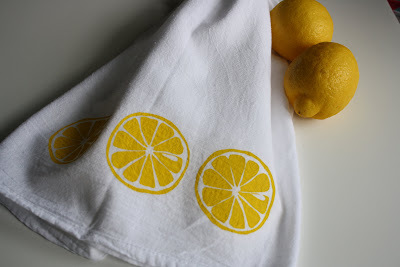 Bazor Designs is giving three lucky winners this adorable hand-screened lemon kitchen towel! This award is limited to U.S. and Canada residents only. I would LOVE one of these in my kitchen! I am starting a new feature on the blog called Food Fun where I will share some of the ways I make food entertaining for my kids. Let's face it, if kids are having fun, they are more likely to try new things. By making healthy foods more of an activity, they will hopefully become adventurous eaters who are open to a wide variety of tastes, colors, textures, and experiences. This week I wanted to share with you my color-themed meal. Occasionally, I will pick a color (with the help of the girls) and plan a meal consisting entirely (as best as I can) of that one color. It is so much fun for the kids! For this dinner, we went with an orange theme. The meal included tomato soup, roasted carrots, grilled cheese panini, and cantaloupe for dessert. This is a wonderful way to get your kids involved in meal planning. So I had been seeing this idea for crispy gnocchi all over the place and finally decided to try it. I have to admit, I was never a huge gnocchi fan because of the texture, so I was excited to try this new version in the hope that I would like it. And do you know what? I DID! :) I have never had any sort of crispy pasta, so this was such a novelty for me. My daughter loved it. The gnocchi were just the right size for her to eat. This was a wonderful, easy meal for the entire family. While the gnocchi is cooking in boiling water, heat the olive oil in a large fry pan over medium-high heat. Drain the gnocchi very well. Add gnocchi to pan and spread them out to a single layer. Let them cook undisturbed until crispy on one side, about 3-5 minutes. Flip the gnocchi over and repeat on the other side. Transfer to a bowl. Stir in the pesto and add some freshly grated parmesan cheese. Serve immediately.